With Wednesday’s announcement of Amazon’s reply to the iPad, the new Kindle Fire e-reader, my Facebook feed filled up with people’s excitement about the new device. Many of these folks were authors whose books we adore and support and sell in our store, and I realized that even they—people immersed in the industry, whose livelihoods depend on book sales—aren’t aware that almost all other e-readers, including Barnes & Noble’s Nook, DO allow freedom of vendor choice. 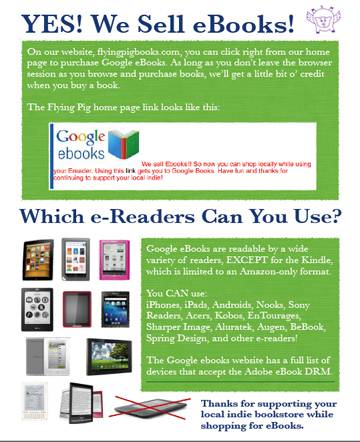 Many folks just don’t know that they can get an e-reader that isn’t locked to a single supplier. Booksellers, we’ve got to do a better job of getting the word out. This entry was posted in Uncategorized on September 30, 2011 by Elizabeth Bluemle. It’s true that readers brand the book source, but I think that’s an overly simplistic way to look at the issue here. Going by that argument, there is no difference between the different e-readers because they’re all tied to a store–a brand. But the fact of the matter is that the only difference for all the other e-readers between buying from the native storefront and literally any other storefront (minus Amazon) is whether or not you have to hook your device up to your computer. That’s it. Amazon on the other hand requires you to find and install a third-party program, run the file you purchased through a converter, and then move it onto your device. It’s not rocket science, but for most people that little bit of difficulty will stop them from branching out and supporting other sellers. But really, that’s not my biggest problem with Amazon. My biggest problem is the way that they make it almost impossible to buy ebooks from them unless you have a Kindle, coupled with the way that they’ve tried to strong arm publishers (using tactics that ultimately did more harm to authors than the publishers themselves). Recent reports about the conditions of their warehouses and their treatment of employees haven’t helped either. I’m not saying anyone should boycott Amazon. But not buying into their proprietary strategies is a pretty easy option. Sorry, that first para was in response to Rusty (below). Apologies for the confusion. I have to say Elizabeth, a *HUGE* part of my refusal to breakdown and buy a Kindle is due to its vendor exclusivity. For the time being I’ll stick with my trusty old Sony eReader circa 2009. Amazon has many problems in addition to an inexcusably outdated DRM policy. They are closing affiliate programs in states that dare to even attempt to collect sales taxes on Amazon purchases. They charge publishers mandatory co-op advertising fees on all of their Amazon sales. I no longer give Amazon my business. I sell ebooks directly from my website in a good selection of formats, including Kindle’s Mobi. I used Calibre to make them. But I think most people will find that any ebook not sold through Amazon will not fit on a Kindle. Amazon has made the software resistant to importing, which means they will not go on the device easily. As a print book publisher and seller, I have seen the writing on the wall; and while I still offer print books for sale, I have made the transition to selling ebooks as a matter of course, not because I have to. Any bookseller who does not like the way Amazon’s selling model is exclusive to all others should make it clear on their own website that they offer ebooks for other readers, and deprecate Amazon’s brand and logos. Recently, I have disabled making my print books available to Amazon out of protest after seeing months of no sales. All of Amazon’s energy is directed toward ebooks, so the only thing I can do is to divest myself of promotion of Amazon as an outlet and concentrate on making my own site the place to go for my books. Otherwise, Amazon will continue to corner the market for both printed and e- books. Those of you who don’t like Amazon’s selling model should do the same. But there are other bookstores and websites that have content for the Kindle. Baen for instance, and Smashwords. It’s not difficult to order from them either. How can a used bookstore sell e-books? Lots of our potential customers have e-books! What do we have to do? I have a Nook Simple touch. Can I buy books in indies and download them? Also, I love Indigo books in Canada. Could I read their e-books on my Nook? Nooks can read e-books from pretty much anywhere–the word to look for is epub, it’s the standard e-book format and the one that the nook (and most other ereaders) supports. As for Indigo, it looks like they sell through kobo which should work fine with your nook. I’ve bought a few books from them and haven’t had any problems on mine. Not true. The Kindle will not read EPUB format, big deal. KindleGen or Calibre will convert anything to MOBI for the Kindle. I would say more than half of the books on my Kindle came from sources other than Kindle. You could have easily looked this up, or asked someone, but instead did what most bloggers do to attract attention. T Milne, I just looked up the formats you are speaking of and was greeted with some pretty intense sets of instruction for each thing you speak of. Let’s be honest, the average Kindle owner, for the most part, is not going to go through the multi-step process of converting their ebooks bought somewhere else, to be read on their Kindle. Nor are they even going to do the research. Why would they, when they can get all the books from Amazon? They will do what most do, what’s easiest and fastest. Which is exactly what Amazon wants customers to do. The point of the post is to remind people that they have a choice. And each book purchase, whether physical or electronic, has wide-ranging repercussions. Whatever is the native storefront for the reader, whether it be B&N or Amazon, is what’s easiest. Chances are, unless people use an explicit generalized reader, the reader brands the book source. Especially because many people devoted to ereaders will simply download the free sample to check out a book. In an ideally open world, the function of bookstores in the future would be more like a library, where the books are available to browse and then your reader would scan a QR code on the book and the right bookstore would automatically get their cut of the sale.